"How to transfer ringtones from iPad to iPhone – Hi there, I just purchased a ringtone from iTunes, using my iPad. I can see under Settings- General- Sounds- Ringtones. However, I can’t seem to find it when I open the iTunes on my iPad. There is no ‘Tones’ section, it’s also not under the ‘Purchased’ section. When I buy music from iTunes using the iPad, it’s all automatically sync-ed to my iPhone, why it’s not the same with ringtones? I would like to transfer this ringtone to my iPhone, but no idea how to do it. Can anyone please help? thanks very much." Many Apple iOS device users would come across such kind of questions. It is very easy to transfer ringtone from iPad to iPhone. You could sync ringtone from iPad to iPhone if you’ve already purchased the ringtone on iTunes store. You could also sync ringtone from iPad to iPhone with the help of iTunes. Or, you could even make use of some ringtone transfer apps to transfer ringtone from iPad to iPhone without iTunes. If you purchase ringtones from iTunes Store on iPad, the purchased ringtones would automatically appear on your iPhone only when you sign in with the same Apple ID. If this doesn’t happen, you could refer to the below content to learn how to transfer ringtone from iPad to iPhone without or with iTunes. 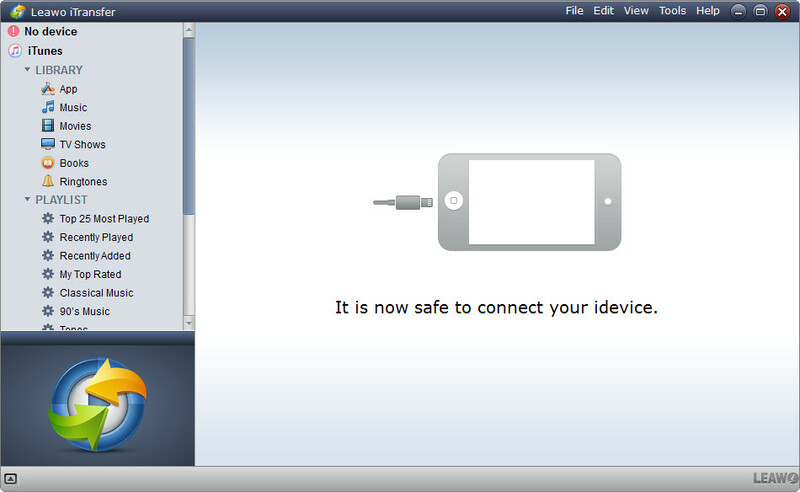 Connect your iPad to computer with the USB cable for iPad. 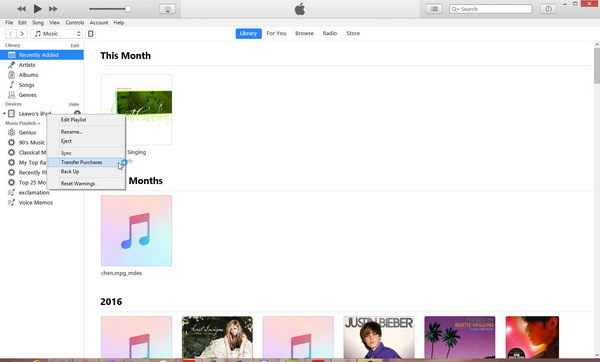 Open iTunes on computer and then you will see the iPad on the left sidebar. Right click the iPad tab and then choose "Transfer Purchases" button. 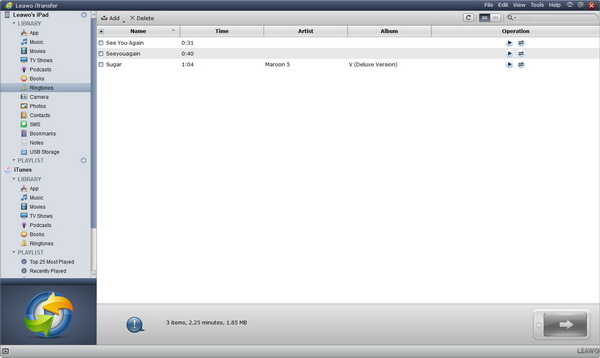 Then all purchased items, including ringtone, will be synced to iTunes library. Disconnect your iPad with computer once the transfer is finished. Connect your iPhone to computer and then you will see your iPhone icon on the sub-menu bar of iTunes. Click the iPhone icon, and go to "Settings > Tones" tab. Check "Sync Tones" option and then decide to sync All tones or Selected tones. After selecting tones to transfer, click the "Apply" button to transfer ringtones from iTunes to iPhone. 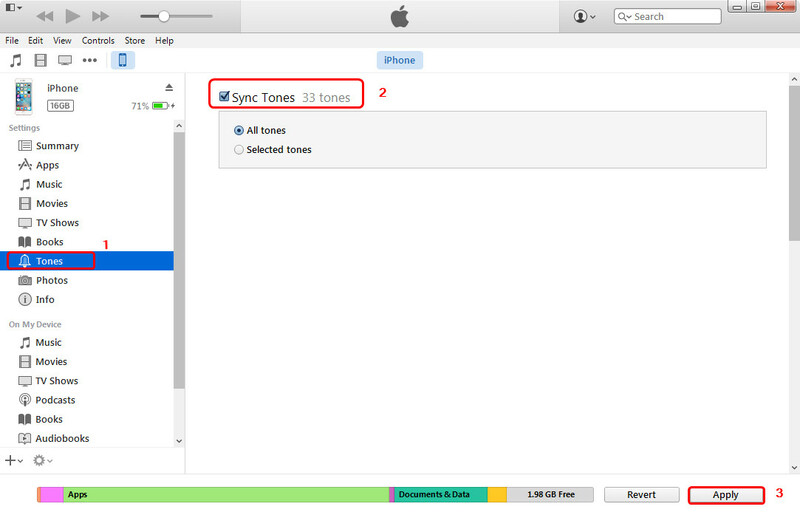 In this way, all purchased ringtones from iPad tablet would be synced to iPhone with the help of iTunes. If you still have other ringtones on iPad you’ve got from other sources, you need to turn to the below content. If you want to transfer custom ringtones from iPad to iPhone, iTunes won’t help. You need to make use of 3rd-party iOS data transfer app to do this. That means, you have to learn how to transfer ringtone from iPad to iPhone without iTunes. Luckily, you get a lot of iOS data transfer app options, among which Leawo iTransfer is the most top-rated. iTransfer is a professional iOS data transfer and manager software app that could help you transfer data and files between iPhone, iPad, iPod, iTunes and computer. It supports up to 14 types of data and files, ringtones included. Download and install this iTransfer on your computer. Then, follow the below steps to learn how to transfer ringtone from iPad to iPhone without iTunes but iTransfer. Run the software and connect your iPad and iPhone devices to computer with USB cables. You could see your iPad and iPhone on the left sidebar. Go to " iPad > Library > Ringtones" tab to select ringtones from iPad for transferring to iPhone. Check them and then right click to choose "Transfer to > iPhone" option, or click the "Transfer" icon at the bottom right corner. You could choose either purchased ringtones or custom ringtones as you like. On the following popup window, check the "Transfer to list" option and then choose your iPhone as target in the "Transfer to list" drop-down box. After choosing target iPhone, click the "Transfer Now" button. Then you will see a window that is transferring ringtones from iPad to iPhone directly.